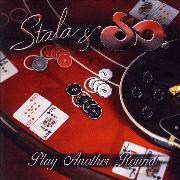 Finnish band STALA & SO was founded back in 1997, has ex. LORDI members Sampsa “Stala” Astela and Nick Gore in their ranks. The band is heavily into 70´s and 80´s glam rock with loads of melody and a positive attitude. In 2011 they participated in the Finnish Eurovision Song Contest. Their debut album “Is It So” came in 2011, they toured Europe with VAIN and recorded this one with renowned producer Beau Hill. I guess they mean business…or? Opener “Rock Until I´m Done” is quite gentle, un-Finnish even? But the next track, “Tokyo Delights”, is a favorite of 2013, it really doesn´t leave me alone! It is very hum-along friendly and sticky. But that nice “The Boys and Having Fun” is very ok, the same goes for “All Alone”, the somehow overlooked bonus Track “Pamela” and their taking ownership of OZZY´s “Shot in the Dark” is also a good sign! But there are easily as many that don´t go down in history…or my memory. It is a very gentle and almost belonging to another genre. There are many good melodies but many just don´t catch my interest as they come close to elevator music. I really jotted down everything from two to three to four in my margin remarks on this one. I will settle for three out of five.